Are you really sure that's what you want for your new porch? If you’re considering adding a new outdoor living space to the back of your home, no doubt you have stood behind your house and imagined where the new space would go, how it would connect to your home and what it would look like. It’s normal to try to determine what’s feasible before going down the path of selecting a contractor. After that process, your mind’s eye probably has some sort of picture of how you would access the new space from inside your home. What if we told you that vision may be all wrong? Our goal is never to change your mind about what you want. 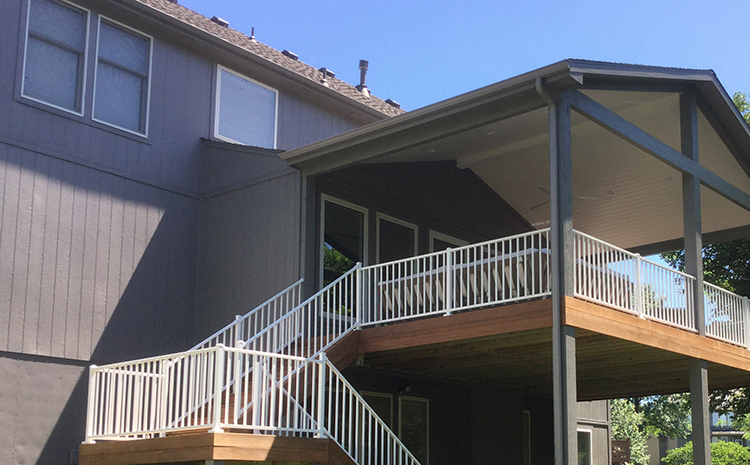 Our goal is to utilize our experience to share some of the benefits and downsides of the new porch’s house connection, size, placement and other design details. With our prospective clients, we share the full range of options and also share our experience when homeowners have selected that option. For example, if you have a deck and are considering converting it to a porch, you likely have a good mental picture about how that will work and about how you will gain access to the space. These Shawnee homeowners had a very different idea and a very different vision. We were able to work with them to create the outdoor living space to meet their objectives. They had an existing deck which they wanted to tear down. They wanted a new open porch in a different place from where the deck was. In addition, they wanted to access their open porch in a different way. They had an interior wall that included a door going out to their old deck, windows and an interior fireplace. They wanted to remove that entire wall – fireplace and all. They wanted us to reconstruct that wall 2 feet farther from the house with all new windows and a new door. They had a very specific vision and we were able to make that come to fruition. 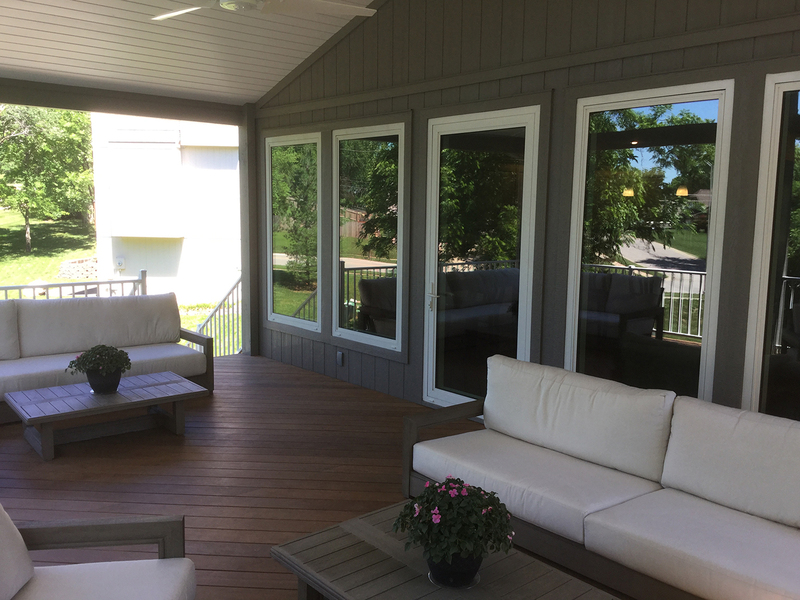 These Shawnee homeowners further wanted a very large open porch and had very specific ideas about the materials and colors. Because the porch was so long and because the porch now needed to support the house wall, extra engineering, supports and architectural techniques were required. In addition to reinforcing the supports, the new open porch is elevated which was another consideration. The new porch is generously sized at 16′ × 25′. It was important to the homeowners to have a low-maintenance outdoor space. They selected ipe Brazilian hardwood for the flooring and low-maintenance alumium railing. The generously sized porch allows for a full seating area and also a full eating area allowing multiple outdoor living opportunities and plenty of room for friends, guests and to host family gatherings. 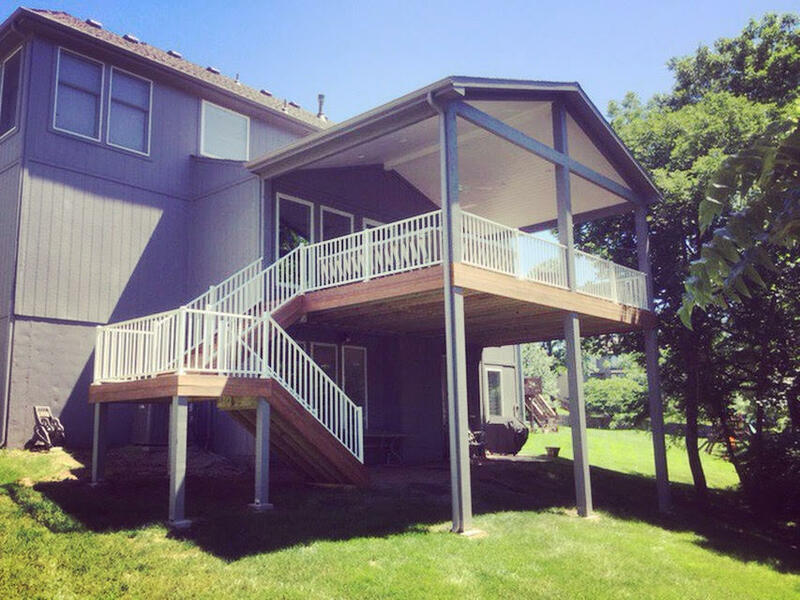 If you’re considering adding a new outdoor living space to your Kansas City area home, give us a call for a free consultation at (913) 851-3325 or drop us an email. We look forward to providing a design consultation to help you envision your new outdoor living space.